The CronusMAX PLUS is the world's best selling cross-compatibility gaming adapter. It allows you to use your favorite gaming controller on PlayStation 4, Xbox One, PlayStation 3, Xbox 360, PlayStation TV or Windows PC. Love your DualShock 4 controller but have to use Xbox One at your buddy’s house? or how about you want to use your DualShock 3 on your Windows PC without installing third-party drivers? Not a problem. Just plug in the CronusMAX PLUS, sync your controller, and you are ready to go. No hassle. Just play! Gone are the days when you are restricted to using uncomfortable controllers because of the system you are playing on. Connector for Wired game controllers, USB Bluetooth Adapters or Xbox 360 wireless receiver. To connect the CronusMAX PLUS on PlayStation 4, Xbox One, PlayStation 3, Xbox 360, PlayStation TV or Windows PC. Switches to the memory slot that you programmed your GamePack, GPC Script or Remapping Profile to, so for example if you want to use a GamePack that you programmed to slot 1 then you need to press the button until the LED displays 1 and so on. 0 means no memory slot is loaded. It resets to 0 when it reaches the end of the available slots (There are 9 available slots). Hold the button for 2 seconds to unload the current active memory slot (it will reset back to 0 - which means no scripts or gamepacks are active). This button can be emulated on your game controller so you can press it remotley, check the Device Options page in the Cronus PRO manual for more details about that. When in programming mode this button resets the CronusMAX PLUS to normal mode. 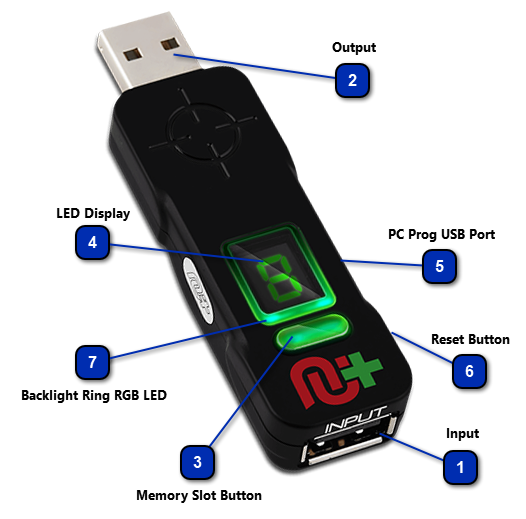 Shows information such as loaded memory slot, error messages, status etc. Interface for programming, monitoring, testing and updating. The reset button is hidden on the back of CronusMAX PLUS device and needs to be pressed with a pin or paperclip, usually with a couple of presses. It will force the device to enter in programming mode. The LED will display a letter P.
Forcing to enter in programming mode could be necessary in cases where it was not possible complete a firmware update (e.g. bad USB cable, power loss) and the CronusMAX PLUS is not working properly. 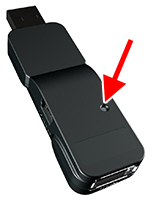 In these situations, with the CronusMAX PLUS connected to the computer through the PC Prog port, press the reset button on the back of the device with a paperclip. This will enable you to redo the firmware update. The CronusMAX PLUS Backlight Ring RGB LED has three options that can be set in the Cronus PRO software. The first is Mimic Controller Player LED. This will mimic the controller LEDs using the DualShock 4 color code: Blue for player 1, Red for player 2, Green for player 3 and Magenta for player 4. This option is very useful to get GamePack LED feedback when using an Xbox One controller. This is the most recommended setting. The second is Strict Controller Player LED. This will strictly display the Player LED set by the console, leaving the controller LEDs free to be used by GPC Scripts or GamePacks. This mode also uses the DualShock 4 color code to represent the Player. The third is Custom Color LED. Choose between 7 different custom colors: White, Yellow, Magenta, Cyan, Blue, Green & Red.